While taking his flock of sheep grazing on the hillside, he saw animals and birds stressed from lack of a watering holes on the hill. BENGALURU: The lake man of Malavalli — octogenarian Kaamegowda — was given the Kannada Rajyotsava award, the second highest civilian award in the state, for constructing 14 ponds at his Daasanadoddi village in Malavalli taluk. Now, he is planning to build the 15th pond with the money received from his Rajyotsava award. The New Indian Express had published a report titled ‘Shepherd from Karnataka builds 14 ponds on barren hill, turns his village green’, in July this year. For his green deeds, he was called ‘madman’ as he started spending every single rupee on digging and developing ponds. Recently, Chief Minister H D Kumaraswamy conferred the Rajyotsava award on him in Bengaluru, where he was given Rs 1 lakh cash and 25 gm of gold. He now plans to spend this money on his 15th pond and to maintain it. Speaking to TNIE from his village, Kaamegowda said that at present he was busy increasing the size of the existing ponds. “I just want to make it bigger, so that more water can be stored. This means, animals and birds will get more benefits. While I am doing this, we saw a large rock in the hill area causing obstruction. I am getting people from outside to get it done,’’ he said. However, he has already planned the 15th pond. “I got money from the award and will spend it on another pond, a new one. Work is likely to begin in January,’’ he said. Do his family members scold him for using the money on the new one? “Yes, they will. They had scolded me for the last 14 ponds too, and they continue to scold me. But that does not stop me taking on a new one,’’ he said. Isn’t 82 an age to rest? Kaamegowda said he will do it till his last day, if God permits him good health. Kamegowda had stated that after he started digging ponds and spending all his savings on them, he started losing his relatives. “But the trees, ponds, birds and animals became my relatives. Some made fun of me...some opposed me for using government land. But I did not stop. I can challenge anyone! Wherever I take up 5-6 ft of digging, there will be water which will not dry up. even during summers,” he had stated earlier. 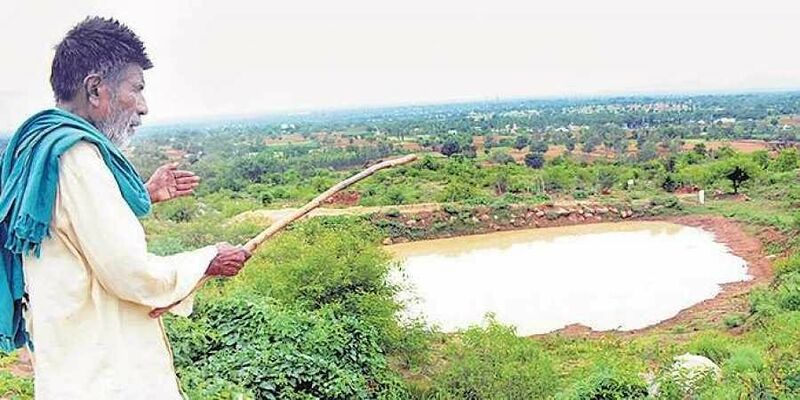 Kaamegowda, a shepherd, who has never been to school, is credited with greening an entire hillside at Daasanadoddi village in Malavalli taluk of Mandya district, an effort that took him four decades and culminated in 14 ponds being developed and maintained by him. These ponds are filled with water all year round. It was about 40 years ago, when he realised that the almost barren Kundinibetta hill next to his village had sparse shrubs with almost no greenery. While taking his flock of sheep grazing on the hillside, he saw animals and birds stressed from lack of watering holes on the hill. Whatever water the hill received through rain, only flowed down its slopes. It hardly retained any water and what little remained either evaporated or got absorbed into the ground.